I covered Jeffrey Rose's work most recently here. 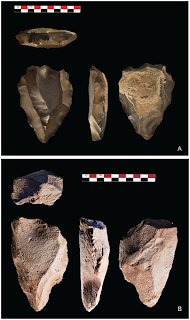 Together with his work on the Gulf Oasis, Jebel Faya, and the Skhul/Qafzeh hominids from the Levant, it now appears that modern humans were widely dispersed >100 thousand years ago in the Near East, possessing distinct lithic technologies. It is becoming increasingly impossible to reconcile this evidence with scenaria of Out-of-Africa after 70ka. The pre-100ka Near East was seemingly teeming with modern humans; it may have been possible to dismiss these as the Out-of-Africa that failed when the Skhul/Qafzeh hominids were the only players in the game, but populations stretching from the Levant to southern Arabia did not simply vanish and were replaced after 70ka. They are in error when they place its origin to Africa. As I have argued before, the archaeological and genetic evidence can be reconciled if the L3/modern human expansion occurred recently Out-of-Arabia, during the super-arid conditions of MIS 4, after having establishing themselves there in the good times that preceded it. I had previously speculated about the origin of modern humans in a wet Sahara, followed by their expansion into West Asia during MIS 5. I don't know how tenable this scenario is archaeologically, but it certainly appears to be chronologically and genetically: modern mankind coming to its own in the wet Sahara, collapsing demographically as the desert reasserted itself; finding a secondary cradle in Arabia, and expanding as the Arabian desert reasserted itself. Is this the solution: a tale of two deserts, pumping humans from Africa to the Near East pre-100ka and from the Near East to the rest of the world post-70ka? The taxonomic identity of the Nubian Complex toolmakers is unknown, as no skeletal evidence has been discovered in association with any such assemblage. Although some archaic forms may have persisted in other parts of Africa at that time , the distribution of early anatomically modern human (AMH) remains suggest this species is the most likely candidate to have occupied northeast Africa during the Late Pleistocene. Cranial fragments of Homo sapiens found in the Omo river valley, Ethiopia (Fig. 1), represent the first appearance of AMH in East Africa ~195 ka . Remains from Herto , Singa , and Mumba  in East Africa date to between ~160 and ~100 ka. Skeletal remains from Jebel Irhoud in Morocco show that an early form of Homo sapiens had expanded into North Africa as early as ~160 ka , and a modern human child discovered at Grotte des Contrebandiers in Morocco verifies the presence of AMH in North Africa by ~110 ka . At the site of Taramsa Hill 1 in the lower Nile Valley, an AMH child dated to ~55 ka was found in association with a lithic industry (Taramsan) that is thought to have developed out of the late Nubian Complex , . Despite the lack of direct evidence, given that AMH are the only species to have been found in North Africa from the late Middle Pleistocene onward, it is warranted to speculate that the Nubian Complex toolmakers were modern humans. I have classified both Jebel Irhoud and Singa, as well as Omo II, and the Qafzeh/Skhul hominids as H. sapiens in my recent analysis of the Mounier et al. (2011) data. So, while it would be desirable to have osteological remains from the sites described in this paper, I'd say the odds are greatly in favor of them being modern humans. Certainly the osteological evidence of modern humans in Africa (Omo and Irhoud, especially) predates that for the Near East. Also, some kind of Out-of-Africa must have taken place, since the Eurasian Y-chromosome and mtDNA phylogeny can be securely seen as a subset of the African phylogeny. Nonetheless, we don't really know when the Out-of-Africa even took place, and it could very well be that there was a first Into-Africa during MIS 5c. 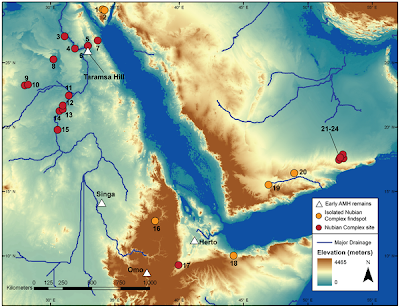 Although southern Arabia experienced successive periods of extreme aridity after MIS 5, terrestrial archives document another increase in precipitation across the interior of Arabia during early MIS 3 , , enabling north-south demographic exchange between ~60–50 ka. South Arabian populations may have spread to the north at this time, taking with them a Nubian-derived Levallois technology based on elongated point production struck from bidirectional Levallois cores, which is notably the hallmark of the Middle-Upper Palaeolithic transition in the Levant , . Further survey in central Arabia is required to test whether the Nubian Complex extends north of Dhofar. Until then, the fate of the Nubian Complex in Arabia must remain in question. The puzzle is slowly filling up. The problem with many of the stone tools found on the Arabian Peninsula, says New York University archaeologist Christian Tryon, is that they don't have much personality. "Stone tools are often unexciting things," he says, "like Paleolithic screwdrivers and hammers." None, he says, displayed signs of craftsmanship that could identify them definitively as the handiwork of African H. sapiens versus other hominids, such as Neandertals. None, that is, until archaeologist Jeffrey Rose of the University of Birmingham in the United Kingdom uncovered tools in Oman in 2010 with clear African connections. "This is the first time I've been convinced," says Tyron, who was not involved in the new work. Jeffrey I. Rose et al. Despite the numerous studies proposing early human population expansions from Africa into Arabia during the Late Pleistocene, no archaeological sites have yet been discovered in Arabia that resemble a specific African industry, which would indicate demographic exchange across the Red Sea. Here we report the discovery of a buried site and more than 100 new surface scatters in the Dhofar region of Oman belonging to a regionally-specific African lithic industry - the late Nubian Complex - known previously only from the northeast and Horn of Africa during Marine Isotope Stage 5, ~128,000 to 74,000 years ago. Two optically stimulated luminescence age estimates from the open-air site of Aybut Al Auwal in Oman place the Arabian Nubian Complex at ~106,000 years ago, providing archaeological evidence for the presence of a distinct northeast African Middle Stone Age technocomplex in southern Arabia sometime in the first half of Marine Isotope Stage 5. There was only one out of Africa event. And that was about 2.1 million years ago. Believing in a molecular clock that dates human expansion out of Africa less than 200,000 or 100,000 years ago and the beginning of life on Earth 10 to 12 billion years ago (more than 6 billion years before the solar system even existed) is just a huge waste of time! There is enough of an error bar on the genetic data to consider an earlier "out-of-Arabia." While migration under climate stress makes some sense, After 70,000 it would have been pretty much impossible, and ~55,000 ya is IMO way too recent to explain the SE Asian diversity and also the various Denisova admixture rates. Also, from the viewpoint of y-DNA, assuming that CT and DE participated in ooA, it is the very first branches (D and C) that made it far East. Well, I disagree, I do not think that there is only two possibilities, I think it is highly unlikely that either geneticists are in error when they date the L3/modern human expansion to 70 thousand years ago, or that they are in error when they place its origin to Africa. The third, most likely, explanation is that those early humans were replaced by other humans out of Africa, just like neanderthals and denisovans were replaced. There is interesting evidence that that "out of Africa tribe" were a tribe of incipient warriors that could very well have replaced those early populations. Commun Integr Biol. 2011 Mar;4(2):163-70. The society of our "out of Africa" ancestors (I): The migrant warriors that colonized the world. IZB; University of Bern; Bern, Switzerland. The "out of Africa" hypothesis proposes that a small group of Homo sapiens left Africa 80,000 years ago, spreading the mitochondrial haplotype L3 throughout the Earth.1-10 Little effort has been made to try to reconstruct the society and culture of the tribe that left Africa to populate the rest of the world.1 Here, I find that hunter-gatherers that belong to mitochondrial haplotypes L0, L1 and L2 do not have a culture of ritualized fights. In contrast to this, almost all L3 derived hunter-gatherers have a more belligerent culture that includes ritualized fights such as wrestling, stick fights or headhunting expeditions. This appears to be independent of their environment because ritualized fights occur in all climates, from the tropics to the arctic. There is also a correlation between mitochondrial haplotypes and warfare propensity or the use of murder and suicide to resolve conflicts. The data implicate that the original human population outside Africa is descended from only two closely related sub-branches that practiced ritual fighting and had a higher propensity towards warfare and the use of murder for conflict resolution. This warfare culture may have given the out of Africa migrants a competitive advantage to colonize the world. But it could also have crucially influenced the subsequent history of The Earth. In the future, it would be interesting to see how we could further reconstruct the society and culture of the "Out of Africa Tribe." Those who still adhere to Out-of-Africa at 70 thousand years must now provide the archaeological evidence for such an exodus and population replacement. There is clear archaeological evidence now for Africa-Asia contact >100ka. Also, the coastal migration theory is dead. Not only because there is no evidence for it, not only because there is evidence of modern humans far from the coast, but also because any modern humans migrating Out-of-Africa along the coast could not -obviously- have replaced the modern humans that were _not_ on the coast. If you take the "coastal" with a grain of salt, it's OK, though. Firstly, because during the time of consideration much of the "North" (i.e., a long distance away from the coast) had competing ancient human populations. Secondly, during much of the migration there were deserts in the North (Iran, Afghanistan, Pakistan, and even India). Surely, AMHs were made for and thrived in savanna-like conditions in the green Sahara as much as in Arabia or parts of India. But when the population reached its limits, it was almost always relatively close to the coast that migration would have been most effective. And once in SE Asia, the savanna factor is out, humans don't live in the jungle at high densities, and the fractal coast line gives a higher effective dimension. Yes, I agree that the coastal migration theory is too simplistic. I would not call it dead, though, because it seems it was the fastest route, but obviously the out of Africa migrants followed all routes. Thank you for supporting these ideas. It occurs to me that a key assumption in OoA discussion is the (in)ability of AMH to cross open water. Watching babies in the bath playing with rubber duckies, kids in a swimming pool with floats we quickly see that play with floating objects is a usual part of childhood curiosity. Take a MSA culture where kids are tasked to gather firewood from water and you get the origins of mastery of stability propulsion and direction of wood in water. The question is then if these mastered behaviors could be used for some directed thinking in problem solving. A measure of such cognitive flexibility could be gained from the ability of those in Nubian culture to correct mistakes in stone knapping "on the fly" to gain a usable tool. They are in error when they place its origin to Africa." Likely both. The whole model of a subset of African lineages leaving Africa is speculative. We don't know if in fact a daughter population should always end up having lower diversity than the parental population. Your recent Bahamas example shows this not to be the case. If segments of a daughter population go through periods of isolation, intermixture and population growth, while the parent population stays stable, grows slowly and stays segregated, then diversity will be higher on the daughter end. The fact that there're no archaeological signatures of an out of Africa expansion at 70K, 60K, 50K, 40K, etc., while there're modern humans everywhere else in the world by at least 40,000 years suggests that there was no expansion out of Africa. Plain and simple. The fact that there's some hominid activity between Africa and Arabia at 100K doesn't prove that these were our ancestors. There are no remains, no ancient DNA. The whole region is notoriously low in linguistic diversity as measured by the number of independent stocks and isolates, which is the only available means of identifying a likely center of dispersal for modern human behavior. TOO FAR for claiming any kinda of expansions from The Nubian-Near east regions around 100kya to 200kya into north africa. I agree with Beastmanager's comment about the mtDNA L3 replacing all and any other modern humans outside of Africa, starting about 80KYA. I am a non-specialist, but very curious amateur reader on history and archaelogy. IMO conclusions based on the results of hard science (including molecular biology) will always trump any conclusions based solely on the subjective observations of specialists in other disciplines. The more we use hard scientific results, the less we rely on the unconscious cultural biases of otherwise earnest specialists. Dienekes, you recently stated that: "Those who still adhere to Out-of-Africa at 70 thousand years must now provide the archaeological evidence for such an exodus and population replacement." Why so? Regardless of what archaeologists have found (or missed), the genetic timeline is not likely to change, unless so other genetic discoveries are made. It is up to specialists in other disciplines to find the evidence they have missed. "the coastal migration theory is dead". "The coastal expansion hypothesis looks reasonable on paper, but there is simply no archaeological evidence to back it up". I have always been sceptical of the great southern coastal migration theory for that reason. "all of the Nubian MSA sites were found far inland, contrary to the currently accepted theory that envisions early human groups moving along the coast of southern Arabia". That's an even bigger problem for the theory. "There was only one out of Africa event. And that was about 2.1 million years ago". It think the evidence is reasonably supportive of a series of migrations into and out of Africa and into and out of various other parts of the world since that date. "I agree that the coastal migration theory is too simplistic. I would not call it dead, though, because it seems it was the fastest route, but obviously the out of Africa migrants followed all routes". To my mind most of us are making two unjustified assumptions. The first is that the migration from Africa to Australia was rapid. The second is that 'Modern Human' equates with 'Upper Paleolithic'. As this post shows, more and more evidence is being unearthed that suggests modern humans had expanded beyond Africa by at least 100,000 years ago. They reached Australia halfway between then and now: 50,000 years ago. To me it is obvious that the Upper Paleolithic's spread is later than that of modern humans, unless you opt to exclude Australian Aborigines from modern humanity. Once we cease to accept the above two assumptions we immediately see that human expansion around the world has been the product of a series of relatively local population explosions, rather than being an all-conquering expansion of a single population of somehow superior beings. And once we accept it took Australians 50,000 years to reach that continent we have an almost unlimited selection of scenarios for the route. The genetic dates for the emergence of Neanderthals (400 kya), the divergence of Denisovian DNA (1000 kya), and the Out of Africa event (70 kya) are each much more consistent with the respective archaeology of the Neanderthals (ca. 600kya), of Homo Erectus (assuming that Denisovians are Homo Erectus descendants) (separated from other Homo Erectus by around 1.6 mya), and of the Out of Africa event (ca. 105 kya), if the genetic dates from the measures used to derive them are calibrated to be longer by a factor of about 1.5 which is well within the wiggle room afforded by population models that go into those dates with species we don't understand the demography of from any direct evidence (as John Hawks noted in a recent post). There is nothing "hard science" about the place of origin of L3 in Africa, or the replacement of all pre-70ka H. sapiens around the world (including not only those in the Near East but also in Africa, that were widely dispersed all over North and East African) by a post-70ka African exodus. The dating of the Nubian Complex in Dhofar _is_ hard science. The fact that hominins from the Levant >100ka show links to Upper Paleolithic Europeans _is_ hard science. Actually, it's one of the things most likely to change a lot - because it has very wide error bars, is not very well locked in with physical data at all, and has repeatedly been shown to be off by a factor of two or three almost every when ancient DNA has beenrecovered and dated. Currently, it is fair to assume that genetic transitions are far older by the above-mentioned factors than those "guesstimated" by very poorly established genetic timings and population number histories. "from the viewpoint of y-DNA, assuming that CT and DE participated in ooA, it is the very first branches (D and C) that made it far East." One of the virtues of an OoA date of 100kya +/- is that it leaves sufficient time for more than one Paleolithic wave of population to move into SE Asia which is what the most parsimonious population model consistent with the Neanderthal and Denisovian automsomal admixture data suggests. Given the presence of Denisovian admixture in some populations that have Y-DNA CT, the absence of Denisovian admixture in Y-DNA D populations, and the presence of Denisovian admixture at the highest rates in populations that lack Y-DNA D (e.g. Australia and Melanesia and Phillipino Negritos), it is a fair inference that Y-DNA D arrived after 50kya-45kya, when Australia and Papua New Guinea were settled, but before 35kya (when the earliest evidence of proto-Jomon populations in Japan, which are Y-DNA D rich, appear. So, realistically, 40 kya +/- 5 ky. The inferential data is pretty good that all of the high Y-DNA D populations (Paleo-Tibetans, Jomon, Andamanese) had no other Y-DNA hgs or quite low frequencies of them, and that the women in these populations were all or nearly all mtDNA M.
The split between CT and DE is very old and is traceable to Africa. The only three places where DE individuals (less than a dozen all told) have been found are Nigeria, Ghana and Tibet. Thus, CT seems associated with the first and primary OoA event (probably 100kya +/-), while DE seems likely to have been associated with much smaller second and final OoA event (possibly with a male only founding group that admixed with Eurasian women they encounted at the end of their voyage) ca. 60ky later, and one way to interpret the odd geographic distribution is that they settled in places that were left over as unpopulated or thinly population after a first wave that didn't have very good oceanic boating capabilities until ca. 50kya (technologies that the Y-DNA population may themselves have adopted and thereby facilitated their expansion). It also seems quite plausible, given the difficulties involved in separating out mtDNA N hgs (found in all of Eurasia) from mtDNA M hgs (with the exception of one or two Holocene backmigrations only in Asia) once they had admixed, the evidence of the apparently two distinct population waves into SE Asia pre-Australia/New Guinea migration in autosomal data, and the absence of evidence of deep sea fishing or crossings to oceanic islands prior to 50kya, that there may have been a first wave of into SE Asia AMH migration by land ca. 70kya-100kya associated with Y-DNA hg C and mtDNA hg M (a recent find put AMH in Vietnam 70kya) perhaps filling a post-Toba void there, a second wave ca. 50kya-60kya that added mtDNA hg N and some new Y-DNA hgs to the mix (as well as boating technology) that quickly admixed the SE population and South Asian population, and then a Y-DNA D/mtDNA M population (that got its matrilineal component from a not yet admixed with mtDNA hg N populatioon at the time for ethnogenesis) ca. 40kya, which in turn would be followed by a Y-DNA hg O population expansion (possibly originating in SE asia) significantly later in the Asian Upper Paleolithic. One possibility is that the tools were left by the precursers of mtDNA L6. I can see L2-6 migrating up the nile, with L2 becoming isolated to the north in MIS 4, L6 being isolated in eastern Arabia, and L3-4 being isolated in East Aftrica. Around 70K, L3 and L4 split, with L3 commencing a coastal migration after 70K. I'm not saying this is definitely what happened, but it fits the genetic and archeological evidence and explains L6 most satisfactorily. Andrew, I concur with your view of DE/ M coming after CT/ N. The distribution of DE/ M fits nicely with a sea-going route. It is very easy to sale from Oman to India (goven the way the moonsoon operates). I have often wondered if the presence of ostrich eggshells in India after 45K could be traced to the later migration of DE/ M.
One question though, I thought DE had been found among the Onge? "if the genetic dates from the measures used to derive them are calibrated to be longer by a factor of about 1.5 which is well within the wiggle room afforded by population models that go into those dates with species we don't understand the demography of from any direct evidence"
"One of the virtues of an OoA date of 100kya +/- is that it leaves sufficient time for more than one Paleolithic wave of population to move into SE Asia which is what the most parsimonious population model consistent with the Neanderthal and Denisovian automsomal admixture data suggests". "and one way to interpret the odd geographic distribution is that they settled in places that were left over as unpopulated or thinly population after a first wave that didn't have very good oceanic boating capabilities until ca. 50kya"
Quite likely in the case of D and E, and even fairly likely to a lesser extent for K. As I've suggested elsewhere D's presence in the Andamans is not evidence of an early arrival there. "there may have been a first wave of into SE Asia AMH migration by land ca. 70kya-100kya associated with Y-DNA hg C and mtDNA hg M"
To me it seems more likely that it was mtDNA N that accompanied Y-DNA C. Several basal N haplogroups are present in Australia, but fewer in New Guinea apart from R-derived ones. "which in turn would be followed by a Y-DNA hg O population expansion (possibly originating in SE asia) significantly later in the Asian Upper Paleolithic". I think the distribution of O suggests more an expansion nearer to the Neolithic from further north: the Yangtze/Yellow River basins. Dateable AMH remains would be the only acceptable proof for this surprising but otherwise feasible speculation. The "lithic finds" on which it is based could equally be explained by the work of late pre-AMH migrants, part of a clearly long intermittent stream of African hominin emigration, only some of which necessarily contributed to the known sequence of extra-African populations. I agree with much of what you said; I have argued the same over years - except that there is an about equal or higher possibility that D arrived in East Asia before C. I know, for many this sounds counter-intuitive. However, (i) the lack of D in the huge transition region is more easily explained if it was very early but not very successful and got overrun by several later migrations East and local population explosions (rather than migrating very late, many 1,000 miles, without leaving a trace). D, being one of the earliest branches, (ii) is a poor candidate for anything past 100,000-70,000 years. In fact, it is one of the best candidates for a very early migration concomitant with the Green Sahara - even before the Arabian finds discussed here. "I have often wondered if the presence of ostrich eggshells in India after 45K could be traced to the later migration of DE/ M". "One question though, I thought DE had been found among the Onge?" Evidently not. It has been found especially in Nigeria but at very low levels in Tibet. "the lack of D in the huge transition region is more easily explained if it was very early but not very successful and got overrun by several later migrations East and local population explosions (rather than migrating very late, many 1,000 miles, without leaving a trace)"
If (which I maintain is entirely possible) D migrated through Central Asia its subsequent absence there is easily explained by the development of the Ice Age. It survived only in isolated pockets such as sheltered valleys in Tibet/West China. It survived only in isolated pockets such as sheltered valleys in Tibet/West China. But it didn't. It's also present in the Andaman islands, for example. And, (IMO) no one migrated through Central Asia after ~ 110,000 ya until ~55,000 - 45,000 ya, when climate and mental capacity and cultural achievements enabled it. "But it didn't. It's also present in the Andaman islands, for example". But its arrival in the Andamans almost certainly long post dates the OoA. On the other hand it was quite likely in Burma for a very long time but we don't have much information about that country. I'm sure someone would have done some work on the Karen regugees in Thailand though. "And, (IMO) no one migrated through Central Asia after ~ 110,000 ya until ~55,000 - 45,000 ya"
And the climate around 120,000 years ago was actually much warmer than at present. Observation - In science today we are looking at smaller and smaller pieces of anthropolic evidence in genetics and, at the same time, old fashioned chuncks of broken rock in another "...etics" and trying to connect the dots. I have a strong feeling that somewhere in the sand and strata at various digs around the world we are not looking close enough at the numerous other pieces of evidence (which we don't even recognize as such today). As with analyzing and reading Ice Cores, each site should have many other residue indicators to enhace what we know and dispell what we can now only imagine. I have a feeling that one of the areas that seperates modern humans from all others who went before us is the size and scope of our imaginations. Hopefully, our imaginations can produce some new things to help us see the past more clearly. Absent dateable human remains, lithic finds are unreliable as exclusive evidence of AMH presence . Individual stoneknappers must have varied in personal talent, and a damn good flint hand axe looks the same no matter what date it came from. One is impressed by the large array of well-tooled hand axes in the Boxgrove site (ca 400KYBP, Homo Erectus, UK). They would not have disgraced Neanderthals or even Cro-Magnons, for the purposes they matched. The images of the Nubia lithic finds do not exclusively indicate an AMH fabricant. Noone has claimed that modern people didn't leave Africa before 80,000 BCE. The claim is that noone outside of Africa survived the Toba eruption between 75,000 and 60,000 years ago. However I understand that the earlier wave of migration also quickly headed for southeast Asia along the coast, and I'd have to see the evidence that the Near East was teaming with modern people. There is no evidence for such an extinction event.
" "Here we have an example of the disconnect between theoretical models versus real evidence on the ground," says co-author Professor Emeritus Anthony Marks of Southern Methodist University. "The coastal expansion hypothesis looks reasonable on paper, but there is simply no archaeological evidence to back it up. Genetics predict an expansion out of Africa after 70,000 thousand years ago, yet we've seen three separate discoveries published this year with evidence for humans in Arabia thousands, if not tens of thousands of years prior to this date."" "the present paper explicitly rejects this coastal migration scenario"
Unfortunately it is really difficult to convince people that such a simple explanation is completely wrong. The 'coastal migration scenario' has never actually stacked up. It was originally invented to explain how the first 'modern' humans, who were rigidly presumed to be associated with the sudden development of the Upper Paleolithic, could have reached Australia so rapidly after its development. In other words the idea was concocted to explain something that did not even exist. Archaeologically there is absolutely no evidence that the Upper Paleolithic originated in Africa. "Archaeologically there is absolutely no evidence that the Upper Paleolithic originated in Africa". Yet another problem that didn't really exist for the rapid great southern coastal OoA migration. The Upper Paleolithic developed long after any possible OoA. And after humans had reached Australia.